They all have a tip size of 0.38 mm. The paper I used is the Steno from Field Notes (Finch Paper Opaque Smooth 70# text in “Bright White”). These turned out to be pretty unique in my stash. Brown is definitely lighter and yellower than my other browns, as is Khaki. I wish Khaki was slightly darker. These new colors are also thankfully different from my other gray gel pens. (Label on these Signo pens go with “grey” as opposed to “gray”, by the way). 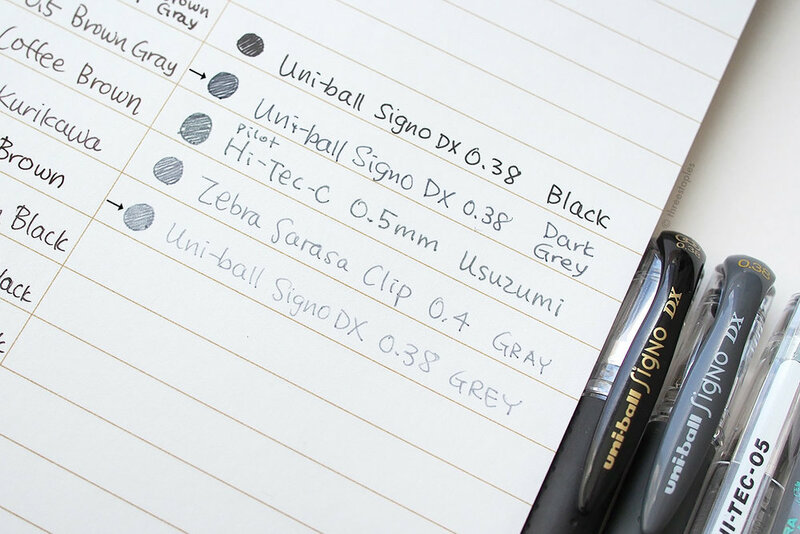 Dark Grey is slightly darker than my favorite Usuzumi (from Pilot Hi-Tec-C), but still noticeably lighter than the standard black. I like that it looks more “neutral” next to Usuzumi. As for Grey, it looks as light as Zebra Sarasa’s gray, but Sarasa’s version actually looks slightly greener. Strangely, I find that the tips on these feel a bit dry and not as smooth as I’d expect out of Signos. I haven’t fallen in love with any of the new colors either, but I appreciate that they’re fairly unique, and I plan on spending more time with Dark Grey and Brown in the future. 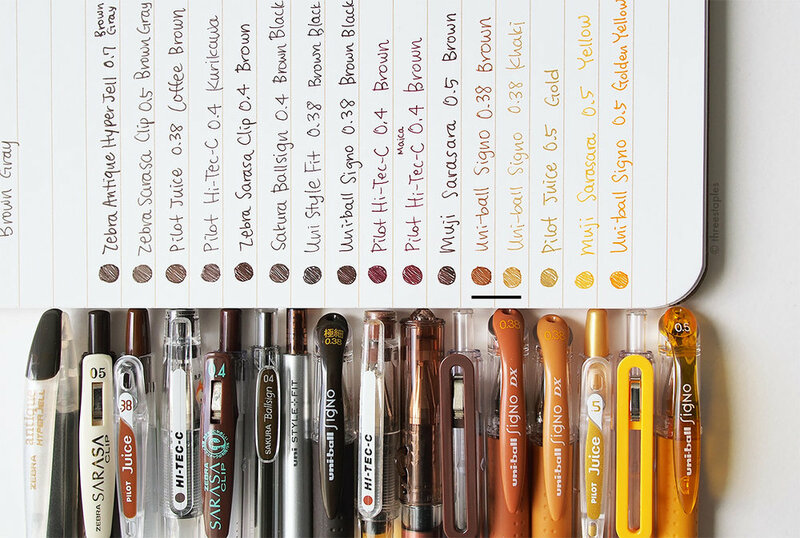 PS: JetPens and Tokyo Pen Shop (both US-based) carry the new colors, although some may be sold out at the moment. This post isn’t sponsored by them; I'm just a satisfied customer at both stores. There was a poll earlier this year (in Japan) where people voted for their favorite Sarasa Clip color, and these are the results, from a total of 5,276 votes. I’m surprised Blue Black/Dark Blue came in 1st, beating Black, and that quite a few of the pastel colors are in the top 20. Red Black (the bottom pen pictured at the top of this post), came in at a respectable 8th, while my favorite, Brown Gray, placed 18th. Poor Copper. It came in 46th, the last place. Side note: I feel like their use of the word 総選挙 or “general election” is supposed to be a joke or a play on words. Maybe somebody more fluent in Japanese / in tune with the culture and current events could help me what got lost in my translation. 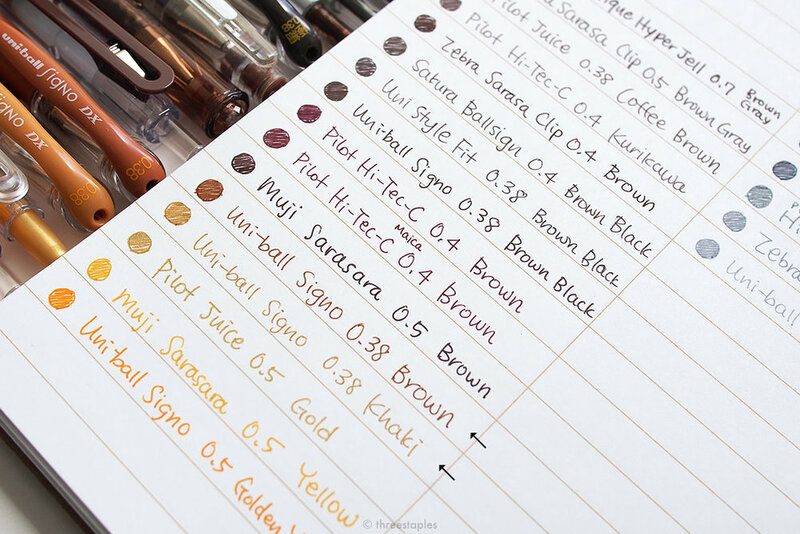 Not to be outdone by Sarasa’s 46 colors, Uni-ball is adding more colors to its Signo line-up (UM-151). (Signo is pronounced SEE-gu-no, dammit.) Gotta love the healthy competition in the Japanese gel pen market, right? I’ve been hoping for more nuanced gel colors, so this is exciting news. The new colors are: Apple Green, Blue Green, Prussian Blue, Purple, Lilac, Light Pink, Yellow, Beige, Khaki, Brown, Gray, and Dark Gray. I don't know when they’ll cross the ocean, but I am most excited to try Khaki, Blue Green, and Dark Gray soon. Release date in Japan is June 16th. Any of these colors catch your eye?